Click image to visit Easy Grammar! Author: Wanda C. Phillips, Ed.D. 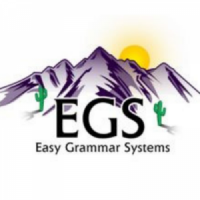 Easy Grammar is a very thorough yet very easy-to-understand study of grammar for students in grades 1-12. This resource is divided into days and/or units depending on the grade level. In all cases, students complete one to two “days” of work each day. The grade level determines what topics each book covers. Some levels include a review of various topics each day (capitalization/punctuation, parts of speech, sentence combining, etc.) while other levels delve into the different parts of speech at a very deep level. One thing that makes Easy Grammar unique is its “prepositional phrase approach.” By deleting the prepositional phrases from each sentence or pair of sentences, students are able to pick out other parts–such as subjects and predicates–with ease. This “trick” works every time and students find it pretty neat, too!